this is ester's blog: beep, beep!!! today when i was sitting in the quiet studio throwing some little bowls, i heard a car honking honking its horn in the courtyard outside. 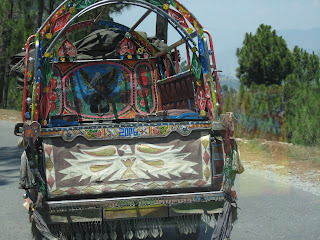 and it made me miss being in Pakistan or Afghanistan alot! here in Sweden you hardly ever hear people use their car horns. i guess it can be annoying at times, but i think it's generally a very useful and somehow cheerful thing. i rarely drive cars, and when i do, it's like a scared snail, but i think next time i drive i'll use the horn. just for fun.